A Warner Classics re-release of three of the more famous albums. Includes the lively madrigals from Italy, France, England, and Germany that they recorded in 1984 during their Madrigal History Tour, which, due to the collaboration with the instrumental ensemble Consort of Musicke led by Anthony Rooley, is considered a gem of early music. 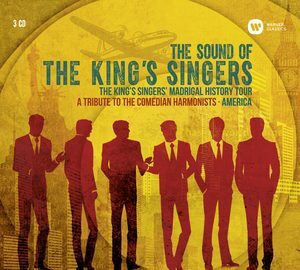 This is in contrast to a further great achievement of the sextet – the King’s Singers’ 1985 interpretations of the cheeky musical and film hits of the Comedian Harmonists, which stand as a tribute to the legendary German vocal sextet from the 1930s. In further contrast, the 1989 album America is a homage to the great US pop songs by Paul Simon, Randy Newman and Jimmy Web, with refined arrangements by David Cullen which were specially written for the King’s Singers and the English Chamber Orchestra under Carl Davis.